Gareth Griffiths, head of sports sponsorship at O2 talks to Nicola Kemp about why 2015 is the most significant year in the brand's 20-year association with England Rugby. The British psyche is not well attuned for sporting success. In the halo of Britain's Olympic glory it is all too easy to forget that far from expecting the best, many consumers and pundits predicted failure from the outset. So as England kicked-off its bid for Six Nations glory, trouncing Wales, it was only natural that some die-hard fans couldn't bring themselves to watch, instead turning to the soothing tones of Mastermind. As head of sports sponsorship for O2, Gareth Griffiths was watching the game at Cardiff’s Millennium stadium and uniquely emotionally and commercially invested in England's sporting success. "With our sponsorship of England Rugby we are in the performance game. We would much rather the team are successful then the sponsorship performs better, you can't hide from that," he explains. In fact Griffiths believes as a sponsor O2 has a "responsibility to galvanise the whole country to get behind the England team." 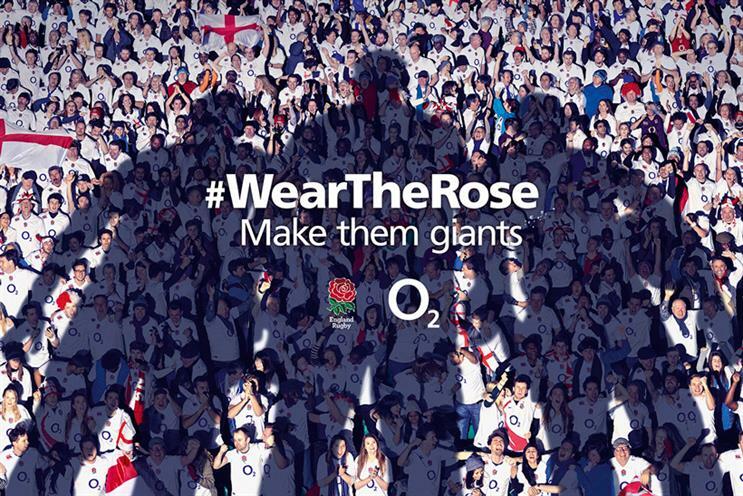 Having just launched what the brand describes as the "most significant campaign of it's 20-year England Rugby sponsorship", calling on fans to "Wear the Rose" there is no question that 2015 will be brand-defining for both O2 and England Rugby. With the Rugby World Cup arriving on English soil on 18 September, organisers claim the tournament will be the third largest sporting event in the world, behind only the FIFA World Cup and the Olympics. For O2, setting the right tone is crucial and the brand has been attempting to unpick the nation's sporting psyche in a series of workshops with consumers. The insight gleaned at these workshops has underpinned the #WearTheRose campaign. "The Olympics and Commonwealth Games has shown how massively important sport and patriotism is in this country," explains Griffiths. Steve Martin, global CEO of M&C Saatchi Sports and Entertainment, says that having a home event really changes the tone. "As a nation we are still surprised by how we got behind Team GB and galvanised across barriers.The Rugby World Cup has a big job to do to get the same essence in the air." Martin points to the "positive patriotism" of the Olympics as being a positive and welcoming force, "What we learned was doing something with a smile on your face makes it 50% better." Unlike the Olympics the stadiums will feature significant branding and as Rugby grows its commercial footprint the challenge for brands such as O2 is achieving standout. In line with this the brand has invested in Occulus Rift experiences to enable consumers to virtually train with the England team. The brand is also projecting holographic England Rugby shirts onto statues across the country. While a dedicated social media channel team are creating bespoke content for the O2 Sport channel in close partnership with the RFU. "We've seen such huge strides in the market, we don't sell phones on text and talking now, it is all about data," explains Griffiths. He believes that the sponsorship market is evolving beyond the lifecycle of an individual event or tournament. A shift which makes connected venues and content key. "Content is about getting it right, but in our industry it is moving from one extreme to another. It is important to remember that it is the quality not quantity that counts, for us storytelling is important. We take content marketing and storytelling as seriously as we do in sponsorship as we do in TV," he adds. The Rugby World Cup comes at a pivotal point in the evolution of the game. In 2011 the Rugby Football Union lost more than £1m in public funding after failing to increase the number of people playing the game at a grassroots level. However, figures from Sport England show this decline has turned around, with significant growth in the 16 to 19 year old age group in the April 2013 to April 2014 period. The popularity of Sevens has driven this growth and the growing investment of brands such as Red Bull and the continued growth of rugby music festivals, such as London’s Summer Social, suggest that brands are riding the wave of this growth. O2 have invested significantly in grass root activity, launching the O2 Touch programme 2 years ago in partnership with the RFU. "If we can get people back to playing after sixth form we can create a real legacy for the Rugby World Cup," says O2’s Griffiths. The RFU has also significantly increased its funding of Women’s Rugby as part of its strategy of taking the game to 100,000 women and girls across the country. According to the RFU more than 18,000 women and girls currently play rugby regularly in England. The England men’s team have a tough act to follow; England Women won the Rugby World Cup in 2014 after beating Canada. Yet while the shape of the game is in the midst of change, the stereotypes surrounding it have remained remarkably consistent. You can imagine the collective clinch at the RFU when UKIP leader Nigel Farage attributed the party’s failure to connect with women to its ‘Rugby Club’ image. M&C Saatchi Sports and Entertainment’s Martin says that stereotypes exist because Rugby has traditionally been marketed to a very vertical audience. "There is a real opportunity to shake off the blood, sweat and tears which doesn’t reflect the audience anymore," he adds. Indeed, O2 estimates there are currently 10 million Rugby fans in the UK, an audience it believes will double over the duration of the tournament. "Right now during the Six Nations you have the core Rugby fan, the ‘big eventer’ who gets involved in the big games then at the third level you have the Rugby World Cup which brings a whole new level of casual fans," explains Griffiths. In the light of this O2 is viewing the Six Nations and the Rugby World Cup as a "single story telling piece". Certainly the culmination of the campaign is already front of mind. Griffiths explains: "Rugby has evolved massively as a game, the 2011 World Cup was challenging but Stuart Lancaster has clear objectives and values. To be a host nation is massively exciting and it’s our responsibility to get the whole country behind the England Rugby Team." For while in the midst of chilly February the Rugby World Cup might seem like a lifetime away Griffiths says amongst fans it feels like it is tomorrow. As the amplification and excitement builds smart marketers are making sure that their brands aren’t sat on the sidelines.